The pumpkin flavor is very subtle so I knew I wanted to top this with a light sauce. It would be yummy with just butter or pesto. I went with a butter white wine sauce with a little bit of hatch chile to give it some pizzazz (I included this bonus recipe below). I garnished it with parmesan and roasted pumpkin seeds to give it another texture. 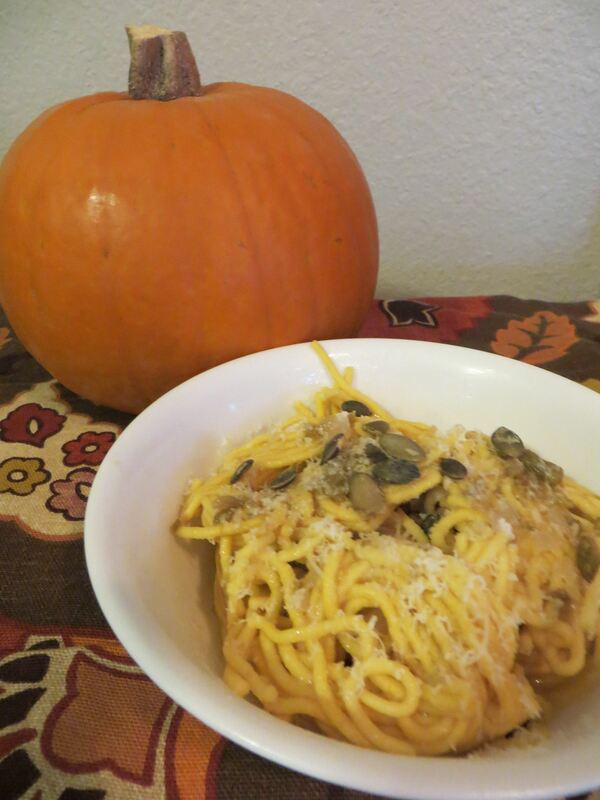 This recipe came together while we decorated pumpkins. I happen to have an underused pasta attachment for my kitchen aid so I made spaghetti using that attachment. If you don’t have a pantry of random kitchen utensils, you can just roll this dough out paper thin and cut into thin strips (like fettuccine) or a little thicker like pappardelle. Combine flour and salt (I used my Kitchen Aid mixer but you could do this by hand or in a food processor). Add in the two eggs and the pumpkin puree and mix until well combined. Drizzle in water until a dough forms. Lay out a generous amount of plastic wrap (you need enough to surround your dough) and sprinkle lightly with flour. Put your dough down, sprinkle with flour and cover with the remaining plastic wrap. Allow the dough to rest 20-30 minutes. Once it has rested, bring a large pot of salted water to boil. Split the dough into fourths and roll into a very thin rectanglish shape (or process through a pasta maker). You will want to sprinkle with a little flour to prevent it from sticking. Once you have rolled it thin, use a pizza cutter or knife to cut into the desired shape. Add pasta to boiling water and stir to prevent sticking. It will only take a couple minutes to cook. I know mine is done when they start to float to the top. Drain and transfer to serving bowls. Top with your choice of sauce and cheese. Add one tablespoon of butter to a skillet and melt over med-high. Add shallots and garlic and cook until fragrant and soft. Stir in wine and hatch chile. Simmer until reduced by half. Add butter one cube at a time. Stir after each addition and add your next cube once the previous one is melted. Once all butter has been melted, turn off the heat and set aside. Your sauce is now ready to serve.